Lanier Spriggs with his family. Photo courtesy Lanier Spriggs. If I was a politician, the first thing I would do—the first thing I would do is cut back the prison budget and increase the education budget. I would probably flip them around. A lot of times these prisons and the police have an unlimited budget. But every year we’re cutting funding for schools and we’re cutting funding for programs like Youth Build. 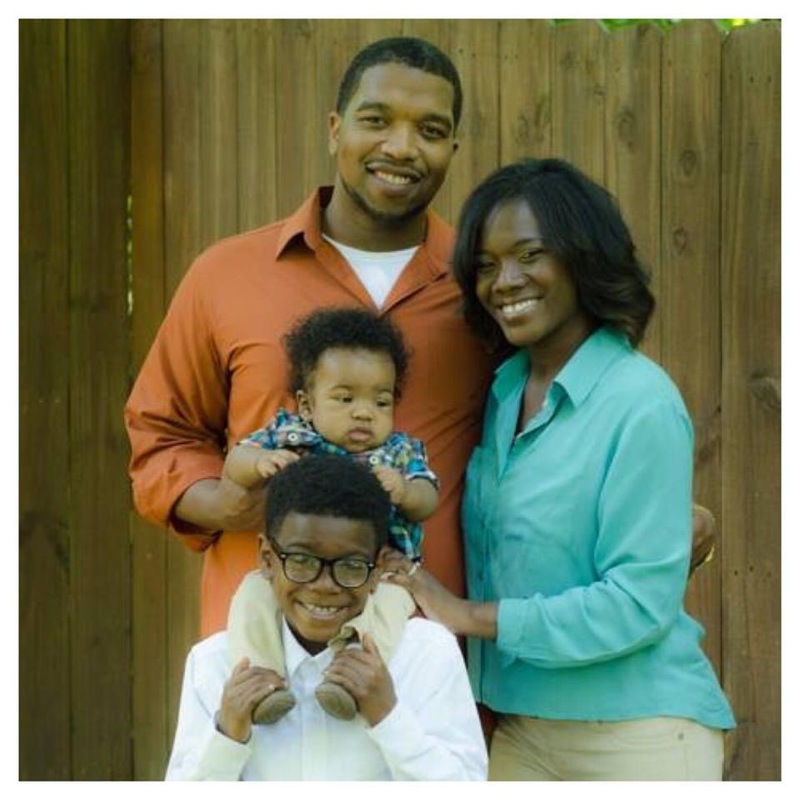 Lanier Spriggs seems like a typical 33-year-old father, husband, businessman, and Chattanooga, Tennessee resident. After working his way through school, he received his Associate’s degree in 2008, his Bachelor’s degree in 2014, and is now a construction manager, earning a steady salary above the national median income. He is active in the non-profit organization Youth Build, a volunteer group that teaches trade skills to at-risk youth. He is also politically savvy, with informed opinions about the current election cycle. But he has never voted in an election. Although he has never been incarcerated, Spriggs is one of the millions of Americans prohibited from voting because of a prior felony conviction. At the age of 19, Spriggs plead guilty to a nonviolent drug crime – his first offense. He received a four-year suspended sentence; Spriggs would never serve a day in jail unless he violated the terms of his probation. “You have to basically take a plea,” Spriggs said, because the alternative is a trial where mandatory minimum sentences attach. Although he has never reoffended nor violated the conditions of his probation, he is still prohibited from voting. Unless the Tennessee Board of Probation and Parole approves his request to have his rights restored, Spriggs will never cast a ballot in a U.S. election. In the eyes of the law, he will always be a felon. Spriggs does not let his past define him. Yet society continues to marginalize him for his youthful indiscretions. He explained, “Being a Black man, to me, already means I have to work smarter and harder than the man next to me to get what I want. I need to have more credentials under my belt, the right image, the right walk, talk, et cetera. I have always had big dreams, and they didn’t die when I caught a felony. I just had to go harder.” With every black box query, felons’ individualities are reduced to their crimes, and they are reminded of this loss when applying for jobs or loans, appearing at the DMV, seeking housing, or attempting to earn a living. The label of felon, Spriggs explained, means “You're out of order. You know pretty much all the time. ...You know that you don't want to pretty much go anywhere,” because everywhere you’re viewed as less than others. For Spriggs and many others, the label of “felon” attaches a significant, stultifying stigma. It makes sense that the symbolic removal of citizenship through “felon” status would amount to losing a piece of self. An unfortunate reality for Spriggs materialized when he realized that a felony conviction meant no access to federal grants for higher education. He had to work throughout college, and he had to change his goal of becoming involved in the medical profession, specifically anesthesiology. In the United States, felony drug convictions usually prevent an individual from joining major medical associations, so Spriggs had to choose a field where “they just don’t care as much about the things you did as a kid.” Instead of a scholarship and a four-year university, Spriggs had to take an alternate path. Although he is now successful in his construction management career, the fiduciary ramifications of his guilty plea meant that he had to work full-time while enrolled in higher education. Of the 5.85 million voting-age citizens disenfranchised because of their criminal records, almost half are people like Spriggs: non-incarcerated, previous offenders. They were found guilty once; therefore, in the eyes of the law, they are never not guilty. Being a felon, Spriggs said, “follows you forever,” and in much of the United States, it may prevent you from even entering the ballot box. Individual states are given almost full authority over their own election proceedings, from registration requirements to polling locations. In the absence of a federal laws regulating felon reentry into the franchise, it is the state legislatures that determine whom among their residents can vote. In 12 states, voting rights are still restricted after a felon is released from prison, has completed parole, and has completed probation. Globally, the United States is the only OECD country to bar its own citizens from voting after correctional control has ended. In ten U.S. states, even some misdemeanor convictions are sufficient grounds for disenfranchisement. Only two states, Vermont and Maine, allow currently incarcerated individuals to vote. Disenfranchisement and disenchantment can go hand in hand. In states where it is legally possible for felons to regain voting rights, informal barriers like fees, waiting periods, and paperwork make this difficult. But arguably the biggest barrier is disenchantment. Unlike the franchised, who generally cite apathy as the primary reason why they neglect to vote, felons have been explicitly told that their political preferences do not, and should not, count. Even once they are eligible for voting rights restoration, that message lingers. In a society that espouses the ideal of “one person, one vote,” disenfranchisement expresses the logical opposite: without a vote, one is not a person. Those predisposed to disenchantment might never fully recover their rights of citizenship. A Georgia resident, John, was tried as an adult and convicted before he reached voting age. “They got me young, stupid. I got older, then I got free, but my heart’s hardened,” he said. Now an adult who has already served his time, he does not know if he is eligible to vote. But even if he were eligible, he wouldn’t. “One vote isn’t gonna change the community. I’m not gonna get involved until they [politicians] get involved. They need to govern on a community level. They need to get back to the neighborhoods,” John explained. This feeling of neglect penetrates to a deep psychological level. It is seemingly programmed into the minds of felons, so that they emerge from prison with “hearts hardened” to the point where they may never truly reunite with society. Lanier Spriggs with YouthBuild participants. “Tough on crime” policies are partly responsible for the school-to-prison pipeline and other ways that our society now polices children. Incarcerated minors, deprived of adequate education, are shuffled from juvenile hall to maximum penitentiary at an alarmingly high rate, and many never truly exit the system. “It’s hard to break out,” said Corrine, who was arrested for drug possession as a youth in Florida. Now a mother of two boys, she worries about her older son becoming entangled in the drugs that once governed her own life. Corrine enjoys a stable job, allowing her to “do all [a mother] should do” for her younger son, who is now almost a teenager. Corrine is focused on raising him “all the way […] with all the best.” But that’s not something she could do during her older son’s formative years. Once a student athlete at a small liberal-arts college, her older son was expelled for distributing marijuana on campus, resulting in a misdemeanor conviction. After his arrest, he seemed uninterested in both school and sports. Corrine laments that he is “almost a lost cause,” because, without a scholarship and with a criminal record, it is difficult to stay on a forward path. “There are many things that will put a child behind bars,” opined Wayne, a self-described “rebel revolutionary” housed in a state-run maximum-security institution. “I want to put a stop to that because the more people that are put into the prison system are more people that get caught in the revolving door of the prison industrial complex.” Wayne singles out “Tough on Crime” policies as partly responsible for his incarceration, and they make him wary of Hillary Clinton’s current bid for the presidency. “She got me in. If she was in office, nine times out of ten, my appeals would still be running fast,” he said, alluding to his belief that his pending appeal of his sentence would be quickly dismissed if Clinton were elected. As the punitive policies of the last few decades funneled more people into prison and kept them there for longer sentences, they removed unprecedented numbers of voters from the electorate. This removal is not “race neutral.” Because non-Whites are arrested, convicted, and imprisoned at much higher rates than Whites (even when crime rates are held constant), disenfranchisement laws disproportionately erode the political power of minorities, especially Blacks. Indeed, stricter disenfranchisement laws are more popular in the South, where, historically, disenfranchisement of “infamous” persons intended to undercut the political power of Black communities through implementation of race-neutral laws subsequently enforced in a race-targeted manner. In states where ex-offenders can regain the right to vote after completing a prison sentence, mandatory waiting periods present serious barriers to rights restoration. Waiting periods typically extend five years after the completion of an individual's sentence. In that time, many individuals re-offend, often by performing one of the everyday acts—like associating with known felons, or failing to pay fees—that can violate parole or probation, or result in re-conviction. A number of states require an in-person interview with the electoral commission before an individual may have their right to vote restored. Spriggs himself is currently navigating a matrix of conflicting state laws in order to become eligible to vote. His felony conviction occurred in Virginia, but he resides in Tennessee, requiring multiple actions in two different states to potentially gain the right to cast his first ballot. Second-class citizenship seems to be alive, well, and as alienating as ever. This combination of waiting, bureaucratic hassle, and subjective evaluation would be met with outrage if it were required for members of the general population to be admitted into the body politic. Yet it is viewed as a justified imposition on felons. Add in the caveats and inconsistencies – which jurisdiction to petition for voting rights restoration, whether a felony in one state precludes an individual from voting in another, how felons are informed (or not) about the possibility of regaining the franchise – and it becomes evident that felon disenfranchisement involves more than punishment for a crime. Instead, it is a systemic way to discourage and prevent subsections of the populace from participatory democracy and, by extension, to obfuscate the path to redemption and societal acceptance. Bruce explained that he felt guilty not knowing that he could vote, but, even had he known, the reentry process makes rudimentary life-sustaining activities so difficult that voting is far from his mind. Others, like John the ex-offender in Georgia, abstain from voting because they no longer have faith in democracy. John said that he has never voted “because I don't believe in the voting process[…] cause you can't vote for none of the above.” In the cases of Bruce, John, and many others, this practical inability to vote – whether structural or psychological – satisfies the original intention behind felon disenfranchisement laws by keeping minorities from upending majoritarian rule. The cruelest irony of Nate’s situation is that he is deemed unfit to vote despite years of good behavior in the penitentiary—his last and only significant disciplinary infraction occurred almost a decade ago—while at political rallies in the outside world, voters have begun assaulting supporters of other candidates. This irony is not lost on Nate, who has closely followed the presidential primaries. Somehow, these violent voters that maliciously maul those with contrary opinions at political rallies are more qualified to elect the next leader of the United States than an individual who is level-headed and well versed in the issues, but who committed a crime years ago, in his early twenties. Christopher, who is incarcerated in a state-run maximum-security institution, explains how electoral politics only began to matter to him once he began serving out his current sentence. Previously, during a two-year span between sentences, “I didn’t care about voting, so I didn’t care I couldn’t vote.” He said that he used to think that politics did not affect his existence as a Black man; instead, he focused on fulfilling immediate needs however he could. “As I got older, I also got a little more right, but that doesn’t mean politicians did, too,” he said. Now Chris follows electoral politics closely, even though he is imprisoned in a state with strict disenfranchisement laws, and he regrets his youthful apathy toward the electoral process. He encourages friends and family who are able to vote to do so. Especially with younger, more vulnerable minds, temporary removal from the political process can lead to permanent exclusion. Preventing this would require a fundamental change in prison structure and reentry preparation. Some states are actively trying to ease restrictions on felon voting. Maryland, for example, eased their felon voting restrictions in February 2016, restoring voting rights to 44,000 people. This feat was achieved, however, only after the state’s general assembly overrode Republican Gov. Larry Hogan’s veto of the restoration bill. In April 2016, an executive order by Virginia Gov. Terry McAuliffe (D) re-enfranchised over 200,000 ex-offenders who have served their sentences and have been released from probation or parole. But the state’s Republican lawmakers are launching a lawsuit to challenge the order. Meanwhile, other states have made the right to vote more illusory for felons. In Kentucky — where one-fifth of the voting-age African-American population is disenfranchised on the basis of prior felony convictions — Gov. Matt Bevin (R) tightened felon disenfranchisement laws in December of last year, just one month after the previous governor relaxed them. Then, in April, Bevin signed into law a new set of procedures that may make voting rights more accessible — but not for all felons, and only after an extensive mandatory waiting period. Of the top ten states in felon disenfranchisement per capita, six are located in South. This has major significance for the coming presidential election. Florida is a telling example. A 2012 study estimated that Florida’s permanent felon disenfranchisement rule eliminates over 1.5 million people from voting – this means that over 10 percent of Florida’s voting age population is categorically barred from the ballot box. The implications for minority communities are even greater: almost a quarter of voting-age African Americans in Florida are unable to vote because of the state’s disenfranchisement laws. Considering that the margin of victory in Florida during the 2000 presidential election was less than 1,000 votes, and that Florida’s electoral votes determined the outcome of the national election, it is more than plausible that less restrictive felon disenfranchisement laws could have changed the whole election, and the nation’s history. During the current electoral cycle, criminal justice reform has become a hot topic for would-be candidates, the media, and many people concerned with the future of the country. Strikingly, however, this conversation excludes millions of individuals with firsthand experience of life under the U.S. criminal justice system. For these individuals, reform is not an abstract topic, but a pressing need. And although some prisons let their inmates watch political debates, these uniquely informed citizens cannot vote, and cannot be heard, because of prior bad acts. As a consequence of the revolving door that removes potential voters from the electorate and pushes them into correctional control, the makers of laws are not elected by those punished by the law. In this light, it seems particularly foolish to categorically prohibit felons from full participation in the democratic processes that create their felon status in the first place. Felons are uniquely positioned to tackle the problem of the criminal justice system in the United States, because their first-person experience generates tremendous insight. Their electoral silence does not indicate a dearth of opinion. Lanier Spriggs, for instance, offers one approach to the many problems plaguing prisons in the United States: budget reform. “If we had an unlimited budget in schools, we wouldn’t need an unlimited budget for the prison system,” says Spriggs. But to reprioritize the budget, voters must put the right politicians in the right positions, and the public must then hold those politicians accountable. Felons, as part of the democratic people, should be able to participate in these processes, or else democracy will stagnate, policies will remain unchanged, and progress will become more elusive and quixotic than before. Although there is no way to quantify the value of an individual vote, to deny an individual the right to participate in the political processes that directly impact their lives seems cruel on face and downright illogical when scrutinized. In the South, where the most felons are without a right to vote, a change in policy could result in a change in the quality of life for the once condemned. When the costs of felon re-enfranchisement are weighed against the benefits, the semblance of rhyme and reason for disenfranchisement collapses. To prevent an individual from voting, especially once they have been deemed fit to rejoin the ranks of a free society, flies in the face of the democratic values upon which the United States was created. If a democracy is to truly represent the will of the people, it must at the least give its citizens the right to influence the laws under which they are governed. This means suspending felon disenfranchisement laws and restoring the franchise so that individuals like Lanier Spriggs can use the ballot as it was intended: to reflect the will of the people – all the people. Keel’s a flat-picker who has shared the stage with greats like Tony Rice, Vassar Clements, Sam Busch, the Yonder Mountain String Band, Del McCoury, the Grammy award-winning Infamous Stringdusters, and New Grass Revival founder Curtis Burch. Since he was a child, fishing and music have been interwoven. "This is a dangerous undertaking. You have to go to where the people are. I had to go into dope houses to bring stuff to people who needed it the most." A first-person account from advocate Steve Daniels.